Marcus Law insists there is very little that surprises him in football these days. It’s been a strange old week for Kettering Town. The Poppies were 3-0 up inside 19 minutes against Cirencester Town at Latimer Park last weekend, only to squander that advantage and allow the visitors back into it with two goals before half-time. 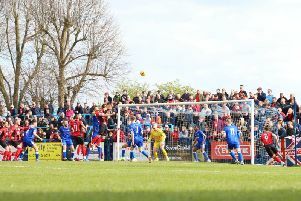 Then Charlie Griffin completed his hat-trick from the penalty spot with eight minutes remaining after Chris Carruthers was sent off. It looked like being one of those days until Wilson Carvalho popped up with a late winner to keep the slim hopes of reaching the Evo-Stik Southern League Premier Division play-offs alive. Just 48 hours later, the Poppies squad were ready to go again at high-flying Redditch United but the floodlights failed shortly before kick-off and the clash was postponed. It leads to this weekend and a trip to take on Cambridge City. Kettering are now eight points behind fifth-placed Hungerford Town with two games in hand. And even Law himself is intrigued to see what the next instalment of the season throws up. He said: “I think we are all waiting to see what happens next! “We certainly won’t do things the easy way. I think last weekend’s game just typified our season to be honest. “I am a bit long in the tooth now and you get to the stage where nothing really surprises you anymore. “It’s been a bit of a strange week but the season is still set up quite nicely for us. It has been a season of struggle for Cambridge City, who play their home games at St Ives Town – a ground on which Kettering have already won this season after they knocked the Division One Central side out of the FA Trophy thanks to a Gary Mulligan goal back in October. But, despite their lowly position in the league table, Law believes tomorrow’s (Saturday) clash represents “another tough ask” for his players. “I think they have had a difficult time with the fact they have had to play at a different ground,” the Poppies boss added. “Despite their league position, I think this is another tough ask for us. “When we played them earlier in the season (a 0-0 draw at Latimer Park), it was on a heavy pitch like it will be this weekend and it was a tough battle.